Mooloolaba Movies under the stars is back for the Summer ! 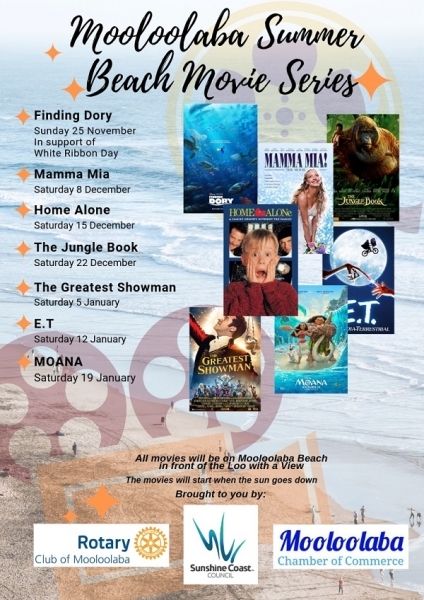 The Rotary Club of Mooloolaba and the Mooloolaba Chamber of Commerce are screening Family Movies, on dark, on the Beach in front of "The Loo With A View"
Saturday 8th December Screening "Mamma Mia"
15th December " Home Alone"
22nd December "The Jungle Book"
5th January "The Greatest Showman"
12th January " ET "
Incase of inclement weather, the screenings will be rescheduled. Come along with your family and friends, bring your chairs or picnic rugs and enjoy the fun.!! !